A missing man has been found after search teams listened to the noise of a rescue helicopter on his mobile phone. 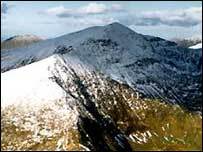 He called North Wales Police in what rescuers called a despondent state from near the foot of Snowdon, the highest peak in Wales and England. Llanberis Mountain Rescue Team, police and search dogs joined the hunt. The man, aged 46, was traced when the rescuers listened to the background noise of the helicopter travelling back and forth to pinpoint his location. Rescue team chairman Gwyn Roberts said the team were called out at 1145 GMT on Friday to help police. Nineteen members of the team took part, as well as two RAF personnel and three search dogs on the 1,085m (3,560ft) mountain. "They found the man's location by using the RAF helicopter to seep backwards and forwards along the mountainside and then listening to the background noise on the man's mobile to see if the helicopter could be heard," said Dr Roberts. "He was eventually found using this technique at around 1700 quite low down on the foot of Snowdon above Llanberis."